The YKK sponsored Widnes Wild hold local bragging rights after an entertaining 11-4 derby victory over fierce rivals Deeside Dragons at Planet Ice Widnes on Sunday. Having not played a home league game against the Dragons’ main team for the past two years, this was one of the Wild’s most keenly anticipated home games of the season for Widnes fans and the face off had to be held up for a few minutes to allow the huge crowd – swelled by a sizeable and vocal travelling contingent from North Wales – to get into the packed Planet Ice rink. The Wild got off to a flying start and took the lead after just 2 minutes with a goal from Chris Gee. A delayed penalty goal 5 minutes later from Danny Bullock doubled the advantage but the Dragons hit back with a goal just 15 seconds from the end of the period to make the score 2-1 after twenty minutes of play. While keenly contested and robustly played, this wasn’t an overly aggressive game and both sides continued to play good hockey. The Wild made their quality count in the second period where they out-shot the visitors by a remarkable 32 to 10 and scored 4 straight goals from Bullock, Jakub Hajek, Michal Novak and Shaun Dippnall to pretty much put the game beyond the Dragons. There was a rather curious incident with some 90 seconds left to go in the period when, after a long discussion between match officials and players, it was decided that the Dragons had, in fact, scored a goal in an earlier attack but which had been missed at the time by the referee. The game clock was rolled back to the time of the goal – 36.50 – and the two players who each were sitting out 2-minute penalties in the “sin bin” saw their penalties wound back as well. The Dragons goal was awarded and, with no more goals in the ensuing 3.10 of the period, the score stood at 6-2 at the second period break. The third period started in dramatic fashion with 4 goals for the Wild within less than two minutes of each other. Strikes from Bez Hughes (at 41.52), Mike Mawer (42.04), Jakub Hajek (43.33) and Shaun Dippnall (43.44) gave Widnes a 10-2 lead and a goal back from Deeside less than 60 seconds after that rounded off a fascinating spell of the game. While the final score and Shots On Goal tally may make this game look rather one sided, the Dragons played their part and continued battling throughout – and Luke Wilson in the Wild goal made several important saves that might otherwise have seen the score ending up closer than it did. 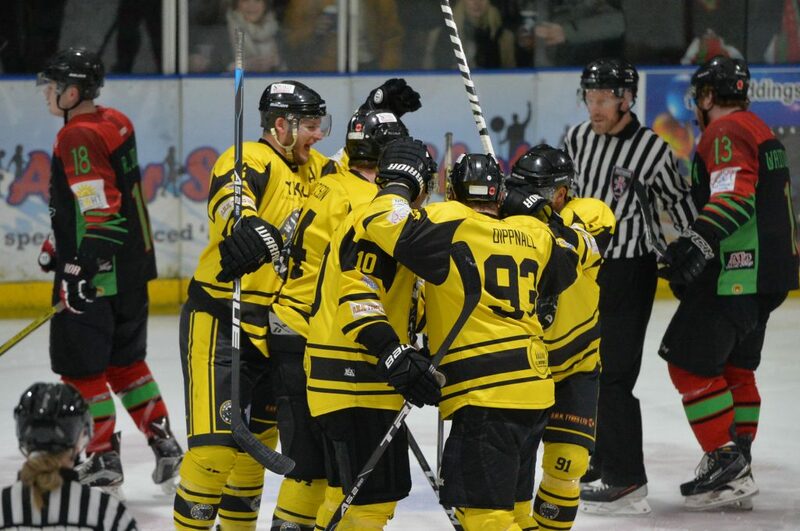 Shaun Dippnall scored his hat-trick goal for the Wild with 5 minutes left to go in the game and the scoring was rounded off with a late Deeside strike with just 7 seconds left on the clock for a final score of 11-4. The win sees Widnes lead the Laidler Division table by 12 points with 7 games left to play in the regular season. Second place Telford Tigers have two games in hand and are the next visitors to Widnes on 17th February. Before that, the Wild have an away trip to Sheffield next Sunday 10th February to face another potential title contender in the Sheffield Senators who are currently in 5th place in the league table but, again, with games in hand. The game at iceSheffield faces off at 12.45pm (lunchtime) but, for anybody who isn’t making the trip – or, indeed, who might want an extra hockey fix afterwards – there is still competitive ice hockey on Sunday at Planet Ice Widnes as the Widnes Wild women’s team take on the Chelmsford Cobras in the Women’s Premier League – face off 5.30pm. The Wild Academy Under 15 team didn’t fare quite so well against their Deeside counterparts as they lost 5-15 in their EIHA Under 15 North League Division 3 game at Planet Ice Widnes on Saturday. This is the first season that the Wild Academy have entered teams into the league and they are playing against long established sides with players who already have 7 or 8 years playing experience under their belts so the main emphasis is on player development rather then challenging for honours at this stage. The positives for the Wild team in this game were that 5 is the highest total they have scored in any game so far this season and the scoring was spread around the team with 8 different players on the scoresheet : Callum Thompson 1+1, Cody Ogden, Jack Davies Jake Meehan & Ricards Konons all 1+0, Phoebe Patient, Luke Mullarkey & Adam Case all 0+1. The Wild Academy Under 13 team move into the spotlight this Saturday 9th February when they take on the Grimsby U13s at Planet Ice Widnes. Face off is at 6.50pm and admission is free.